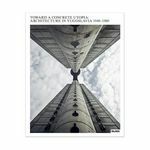 The monography Toward a concrete utopia: Architecture in Yugoslavia 1948-1980 was published in conjunction with a major exhibition of the same title, on display in MoMA New York. Among others, the exhibition features over 60 works by Slovenian architects and designers. 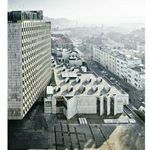 The exhibition and the catalogue were conceived with collaboration of many experts from the territory of the former Yugoslavia, who have been working on this subject for at least a decade. Even more, the exhibition could be called a synthesis of numerous exhibitions, research, seminars, conferences and publications, which came to be in these parts lately. 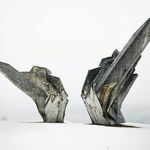 A crucial role among them belongs to the exhibition Unfinished Modernisations that was on display at the Maribor Art Gallery already in 2012, as part of the European capital of Culture programme. 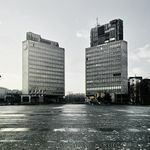 It was the result of a long-lasting endeavour of more than 30 experts and a key survey into Yugoslav architecture. Introductional studies written by Martino Stierli and Vladimir Kulić. essays by: Maroje Mrduljaš, Jelica Jovanović, Vladimir Kulić, Luka Skansi, Vladimir Deskov, Ana Ivanovska Deskova, Jovan Ivanovski, Łukasz Stanek, Tamara Bjažić Klarin, Theodossis Issaias, Anna Kats, Sanja Horvatinčić in Andrew Herscher. case studies by: Vladimir Kulić, Tamara Bjažić Klarin, Mjerema Zatrić, Anna Kats, Matthew Worsnick, Martina Malešič, Juliet Kinchin, Vladimir Deskov, Ana Ivanovska Deskova, Jovan Ivanovski, Luka Skansi, Arber Sadiki.